Your character has an interesting perspective on the Dead – was that hard to relate to? Celia’s relationship with the dead is one of caretaker. Marlene had a hard time with the dead! One of the hardest scenes I had to shoot was the one where Nick bring backs Luis. The make up on this show is amazing and very real looking. 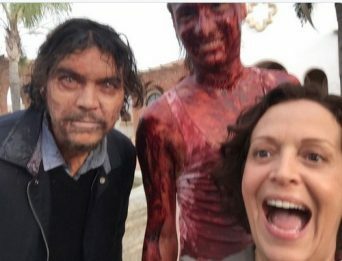 Arturo, who plays Luis, was foaming at the mouth and spitting blood out. His eyes had these contacts which made his eyes look dead! And there I am having a love affair with him! I had a hard time NOT gagging! But in all seriousness, Celia’s relationship with the dead goes back to the Mexican culture. Day of the Dead! Death is just the next step. And the living very much continue to communicate with the dead. Very much like Ofelia speaks to her mother at the altar. Now, we don’t keep them in the basement! But there is a big element of that. Now, like Celia says, we can’t see the dead, but they have always walked among us! Well, Marlene doesn’t think she is a villain! I try not to judge my characters. Even the most horrible serial killer doesn’t think they are doing anything wrong. Celia is just assisting with the inevitable: death! We are all heading in that direction! 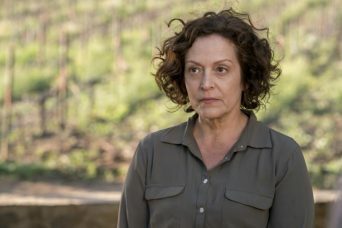 What did it mean to you to play the mother of the first gay character on the series? I was thrilled! I love that fact that nothing was really made out of it! It was just introduced and was not discussed! I think it is becoming more visible on TV. I work on The Fosters too, and I love that show for the same reasons! It is just a family show that centers around love. It doesn’t matter who you love! And “family” doesn’t necessary look like the Brady Bunch anymore! I really hope that this isn’t an issue in the future. Everybody go out and VOTE! Diversity has always been a real problem in Hollywood and, though it has improved, it hasn’t improved anywhere near enough. Do you think being a latinx actor is any easier now than it was when you started out, in terms of roles and representation? Yes I do think it’s easier. But we are not yet properly represented on TV like the African American community. I always say it, we don’t have our own Tyler Perry or Oprah! When I started, I was still married to my daughter’s dad. He is Rodriguez. That was not a choice back then. My reps at the time wanted to change it to Rodrick. I was born Ana Marlene Forte Machado, I said. “Pick one!” Even Machado was too ethnic 21 years ago. Now no one blinks at Rodriguez or Lopez. But we still have a long way to go. Your real life backstory is a fascinating one – can you tell me a bit about your life before you started acting? am the oldest of three girls, the only one born in Cuba. I was very sheltered and married my high school sweetheart. Within a year I was pregnant and he wanted two more! LOL – I was done. I always knew I wanted to act and I just knew, even back then, that I could not have more kids and be an actor. So we played house for four years; until we graduate college. He went off to be a doctor and I went off to be an actress. I really didn’t get started till the late 1980’s. I ran my own video store back at the start of the whole thing for about 5 years. And then Blockbuster hit the scene and I exited stage left! I had just gotten into The LAB (Latino’s Actor’s Base) at Intar and I saw the writing on the wall. I was not getting any younger so I moved to Manhattan. And that’s when it all began. You’ve appeared in a lot of TV shows over the years, you’ve pretty much been in everything – any highlights? Any current shows you’d love to appear in? I would love to do The Walking Dead but that’s not going to happen unless the east coast meets the west coast! I really loved working on Dallas. I enjoyed the city of Dallas and the cast was just the best. And I must say that Fear The Walking Dead has been the ultimate roller coaster so far! The fans are the amazing and I really enjoyed bringing Celia Flores to life! Francesca Lewis is a queer feminist writer from Yorkshire, UK. She has written for Curve Magazine, DIVA Magazine, xoJane and The Human Experience. You can find her opinion pieces on Medium. Posted July 4th, 2016 & filed under Entertainment.